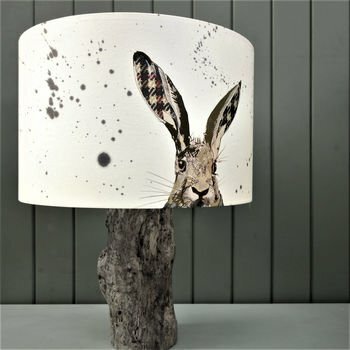 Mud splats and a startled hare on a crisp white cotton shade. Hand made with humour on a small Scottish island. A perfect gift for all craving or indeed living “the good life”. 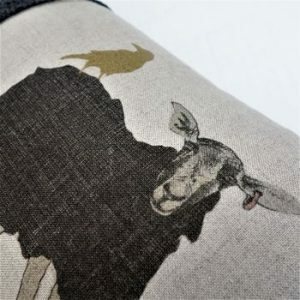 This quirky shade has been hand crafted on the small Scottish island of Lismore where our inspiration comes from the critters we see daily on our Hebridean Croft. 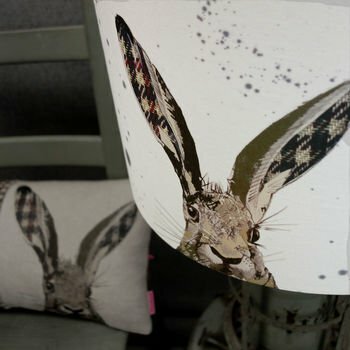 Hares are often seen dashing out from the grassy tufts and bounding through gaps in the rylock. 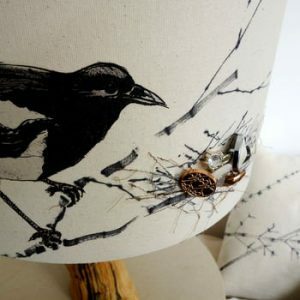 This shade is made using a combination of photographic transfer, scribbled lines and stitched details and each animal image begins life as a humble pencil drawing. The base fabric is a crisp, white cotton sateen. 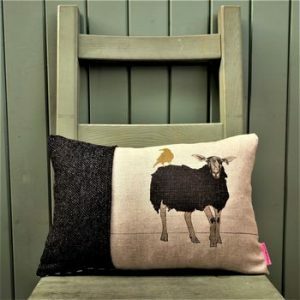 We can envisage this shade sitting equally well surrounded by old books and weathered velvet in some country pile or adding quirk and humour to a sparcely decorated, modern pad. 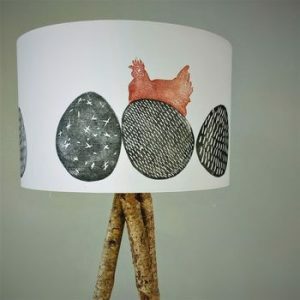 Due to the bulk and fragility of this item I can only ship the made lamp shade within Europe. 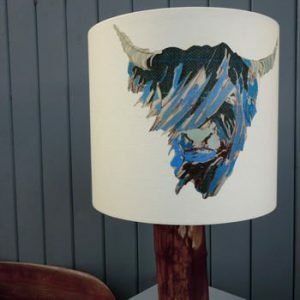 However, you can also purchase this lampshade in a flat pack kit form with clear instructions: please message me if you are interested in this. 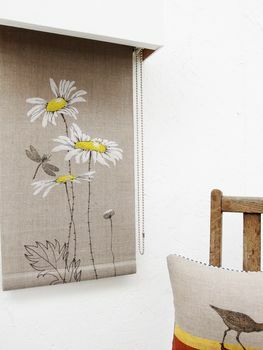 This shade can be ordered to sit on a lamp base or hang as a ceiling pendant. 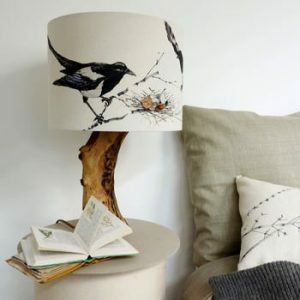 Receive a 10% discount if you order your shade with a Mogwaii log lamp base (choose from three sizes in the options tab). 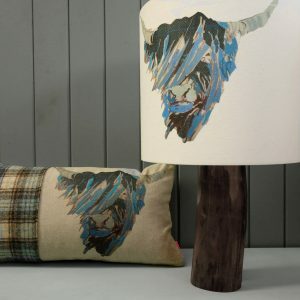 Log base materials: Sycamore log from our island croft – dried and debarked, batten lamp holder (for bayonet light bulbs UK size fitting), white flex, white plug (3 amp) and white lampshade switch and a faux suede base pad to protect your table surface. 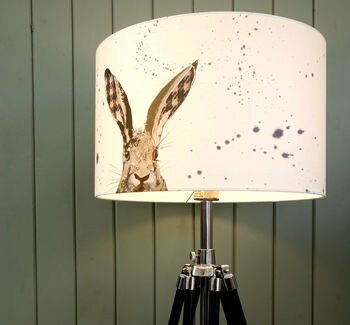 The lampshade has a European sized bulb ring (suits Ikea bases), however, it is also fitted with an adaptor to suit UK bases. 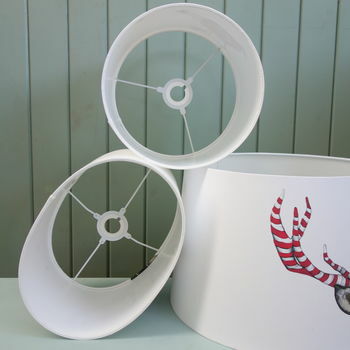 Log Lamp Base Sizes – Small D7 – 8cmxH23cm, Medium D8 – 10cmxH25cm, Large D10 – 12cmxH28cm. 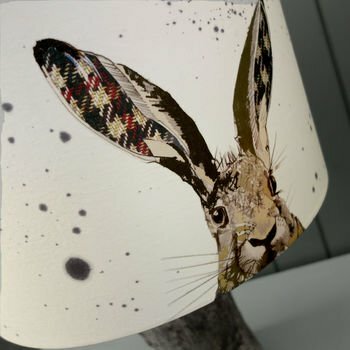 Mogwaii Design creates distinctive lampshades and cushions inspired by the Hebridean plants, animals and landscapes that surrounds artist, Sarah Campbell on her Scottish Island Croft. 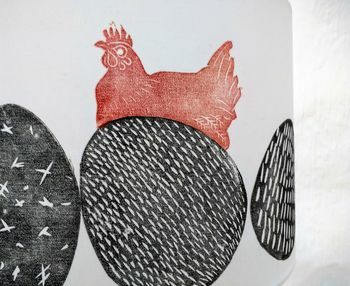 Sarah uses a variety of processes including lino print, sketch, stitch, applique and photographic transfer to give each Mogwaii item its own unique character. 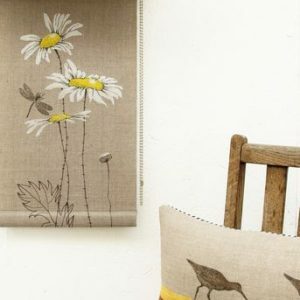 Sarah works primarily with linens, cottons and silks with a focus on creating high quality items that will endure the rigours of daily life and give long lasting pleasure.